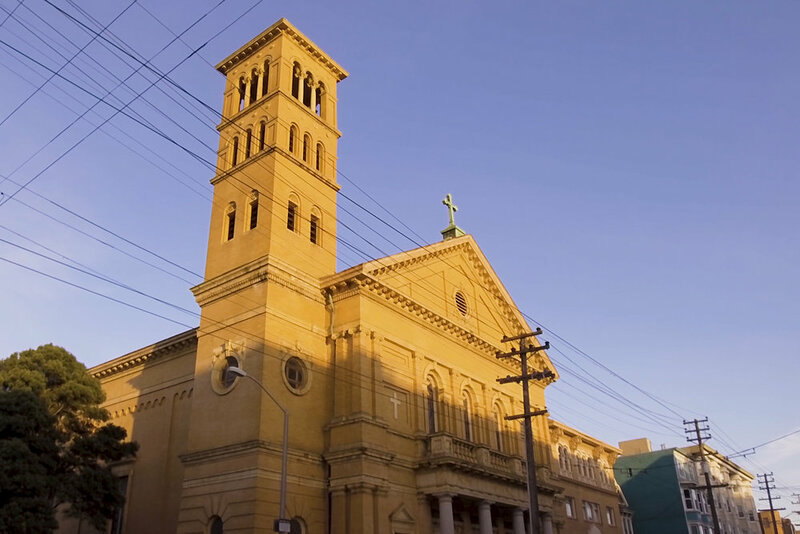 We can guarantee that when you tell people you visited a church built in the 1890s during your stay in San Francisco, this place won’t be the kind of thing they imagine. While Sacred Heart church was closed by the archdiocese in 2004, the Italianate building still holds many of the things you’d expect, including elegant stained glass windows with images of the Virgin Mary and Joseph, murals, and a towering campanile. It also holds a few things you wouldn’t expect, like a disco ball, 70s dance music, and 100 people rolling around on skates, likely in costume. The Church of 8 Wheels was founded by David Miles Jr, known in San Francisco as the Godfather of Skate. Miles Jr has played a major part in the San Francisco roller skating scene since he moved there in 1979. His “church” began in Golden Gate Park with a group of skaters who turned up “rolligiously” on Sunday afternoons. In 2013, Miles Jr arranged with the current owner of the Sacred Heart building to host a one night only skating party. The night was a success, and the owner agreed to let Miles Jr host a skating night once a week, at least for a while, to see how it goes. Years later, the party is still going and has only grown. Aware of the special significance the building holds in the community, a sign at the entrance reads, “Many in the community still see this as a sacred place. Please be respectful. No drinking. No smoking. Just skating.” While the parishioners of the former church were at first reluctant to embrace the building’s new direction, Miles Jr happily reports that they have changed their minds. The Church of 8 Wheels is a place that welcomes every person of every skating ability. It is a place to rediscover those fun and awkward nights as a teenager at the local rink, and tap into the pure energy of San Francisco. No one is there to show off; everyone is there to have a funky good time. The disco rink is open Friday and Saturday nights from 7pm to 11pm. Entrance is $10, with skate rentals of all sizes available for $5. While Friday and Saturday nights are adult-only, the kids definitely don’t miss out. A family-friendly session is hosted every Sunday afternoon from 3pm to 5pm, entrance is $10 for adults and $5 for children aged 12 and under.